Coming up with a soup for my own Super Soup Challenge was, well, a challenge. My brain has been a little hazy about my recipe. I couldn’t make a solid decision about which direction I wanted to go. I spent hours scouring the Internet for a recipe that inspired me. I rifled through the boy’s soup cookbooks at his house. Cold soup? Creamy pureed soup? Oh bother. I was getting grumpy. See…the whole purpose of this challenge – for me, at least – is doing this in the way that my mom would have done it. Easily and breezily thrown something together. A bit of this and a bit of that…and it would have been delicious. So last night, I really thought about the things I like in soups. Little pasta bitties. Different textures. A brothy, comforting soup you can tuck into. It all came together suddenly. I’d make a twist on soups with some bitter greens in it. I love soups with kale and the like in it…so I’d spin it with a little radicchio thrown in at the last minute for the bitter part. Some acini de pepi pasta, which I had just discovered in a wacky salad at my mom’s memorial service. Some caramelized onions and fresh herbs in the broth. A colorful, interesting and easy soup to make. As I was standing over the cutting board, getting all my bits together…I realized that the ingredients on my countertop reminded me of my mom’s favorite flower. Stargazer lilies. Goodness…she adored them. Every year on the night before her birthday, I would get some and tie them together with raffia and make the bouquet to take to her. We would always go and have a wonderful meal and that – along with those flowers – would be her perfect birthday. Last year, I took those flowers to her in the hospital…no fancy dinner but happy to have the chance to give her that bouquet. So. There I stood…staring at all of the parts and pieces of the bouquet I didn’t even realize I was making. I made "stargazer soup" on September 6th. My mom’s birthday. I sniffled and wiped the tears from my eyes – it was the onions, really. It was a morning spent honoring my mom in a new way on this most special and emotional day…and the soup is really good, too. – Bring stock to a boil in large stock pot with thyme sprigs. When the stock comes to a boil, throw in the pasta and cook until al dente, about 5-7 minutes. – Meanwhile, slowly saute your onions in the olive oil until they are wilted and caramelized. – Fish out your thyme sprigs – the leaves will come right off the stem. – Before serving, add radicchio and allow to heat through – about 2-3 minutes. 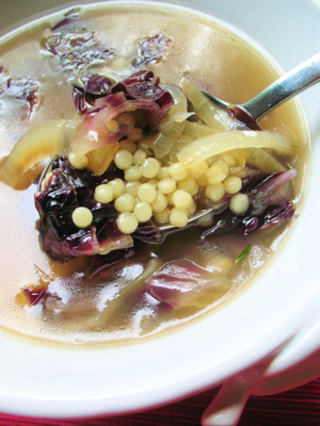 I would not let this soup sit and percolate because the radicchio looks icky and gets strong. If you add it right before serving, it stays light-ish in color and still has good texture. Optional: a little drizzle of nice extra virgin or truffle oil goes well with this, too. The beautiful stargazer photograph was taken by Audrey, who graciously allowed me to use it when i found her stunning photos on flickr.com. Thanks! This really is a sweet post. I lost my mom at 14, so your soup tribute to yours and describing your process of creating Stargazer Soup did make me teary. Thanks for the connection and soupy inspiration. By the look of the acini de pepi in your picture, I think I know it as Israeli Couscous. I’ve only seen it packaged as that in the US as well. So if people are looking for it, that may help. It’s one of my husband’s favorite recent discoveries. Thanks again. 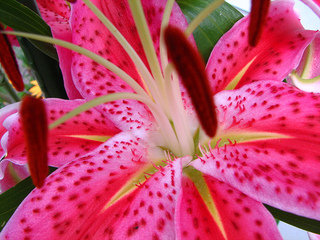 I love that flower but didin’t know it was called Stargazer lily. I wondered if the tiny pasta were Israli Couscous. Great idea to put it in soup. Thanks for sharing the memory of your mom. My dad taught me how to cook. We lost him 1 year ago. His birthday is in a few days – I already know exactly what I am going to cook that night. I hope I get through it with the same grace you showed in this post.